The Dong Son Drum (or Dongson Drum) is ​the most famous artifact of the Southeast Asian Dongson culture, a complex society of farmers and sailors who lived in what is today northern Vietnam, and made bronze and iron objects between about 600 BC and AD 200. The drums, which are found throughout southeast Asia, can be enormous--a typical drum is 70 centimeters (27 inches) in diameter--with a flat top, bulbous rim, straight sides, and a splayed foot. 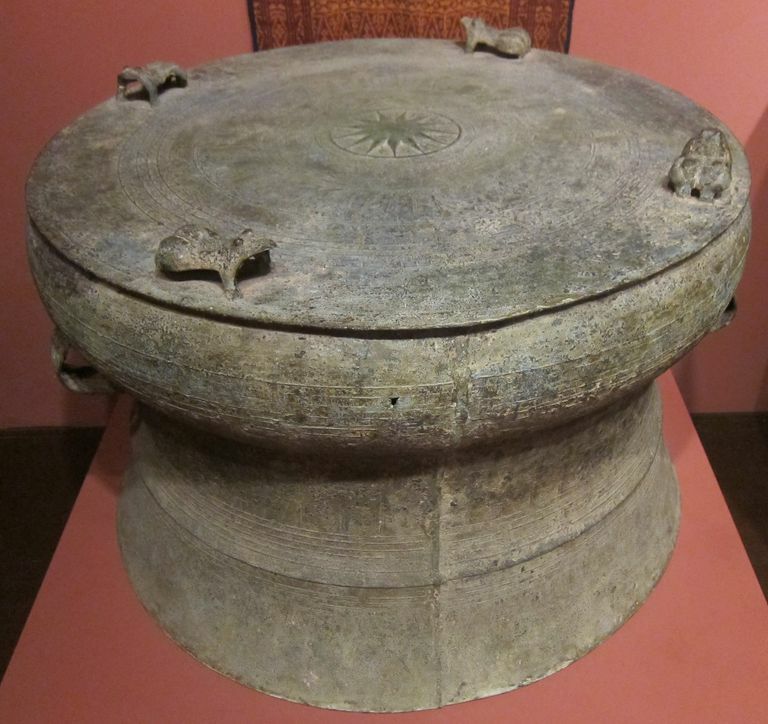 The Dong Son drum is the earliest form of bronze drum found in southern China and southeast Asia, and they have been used by many different ethnic groups from prehistoric times to the present. Most of the early examples are found in northern Vietnam and southwestern China, specifically, Yunnan Province and the Guangxi Zhuang Autonomous Region. The Dong Son drums were produced in the Tonkin area of northern Vietnam and southern China beginning about 500 BC and then traded or otherwise distributed throughout island Southeast Asia as far as the western New Guinea mainland and the island of Manus. The earliest written records describing the Dongson drum appear in the Shi Ben, a Chinese book dated from the 3rd century BC. The Hou Han Shu, a late Han dynasty book dated to the 5th century AD, describes how the Han dynasty rulers collected bronze drums from what is now northern Vietnam to melt down and recast into bronze horses. Examples of Dongson Drums have been found in elite burial assemblages at the major Dongson culture sites of Dong Son, Viet Khe, and Shizhie Shan. Designs on the highly ornamented Dong Son drums reflect a sea-oriented society. Some have elaborate friezes of figured scenes, featuring boats and warriors wearing elaborate feather head-dresses. Other common watery designs include bird-motifs, small three-dimensional animals (frogs or toads? ), long boats, fish, and geometric symbols of clouds and thunder. Human figures, long-tailed flying birds and stylized depictions of boats are typical on the bulging upper part of the drums. One iconic image found on the top of all Dongson drums is a classic "starburst", with a various number of spikes radiating out from a center. This image is immediately recognizable to westerners as a representation of a sun or a star. Whether that was what the makers had in mind is something of a puzzle. Vietnamese scholars tend to view the decorations on the drums as a reflection of cultural characteristics of the Lac Viet people, early residents of Vietnam; Chinese scholars interpret the same decorations as evidence of a cultural exchange between interior China and China's southern frontier. One outlier theorist is Austrian scholar Robert von Heine-Geldern, who pointed out that the earliest Bronze Age drums in the world come from 8th century BC Scandinavia and the Balkans: he suggested that some of the decorative motifs including tangent-circles, ladder-motif, meanders and hatched triangles may have roots in the Balkans. Heine-Geldern's theory is a minority position. Another point of contention is the central star: it has been interpreted by western scholars to represent the sun (suggesting the drums are part of a solar cult), or perhaps the Pole Star, marking the center of the sky (but the Pole Star is not visible in much of southeast Asia). The real crux of the issue is that the typical southeast Asian sun/star icon is not a round center with triangles representing the rays, but rather a circle with straight or wavy lines emanating from its edges. The star form is undeniably a decorative element found on Dongson drums, but its meaning and nature is unknown at present. Long-beaked and long-tailed birds with outstretched wings are often seen on the drums, and interpreted as typically aquatic, such as herons or cranes. These too have been used to argue a foreign contact from Mesopotamia/Egypt/Europe with southeast Asia. Again, this is a minority theory that crops up in the literature (see Loofs-Wissowa for a detailed discussion). But, contact with such far-flung societies is not a totally crazy idea: Dongson sailors likely participated in the Maritime Silk Road which could account for long-distance contact with late Bronze Age societies in India and the rest of the world.There is no doubt that the drums themselves were made by the Dongson people, and where they got the ideas for some of their motifs is (to my mind anyway) not particularly significant. The first archaeologist to comprehensively study southeast Asian drums was Franz Heger, an Austrian archaeologist, who categorized the drums into four types and three transitory types. Heger's Type 1 was the earliest form, and that is the one called the Dong Son drum. It wasn't until the 1950s that Vietnamese and Chinese scholars began their own investigations. A rift was established between the two countries, in that each set of scholars claimed the invention of bronze drums for their resident countries. That split of interpretation has persisted. In terms of classifying drum styles, for example, Vietnamese scholars kept Heger's typology, while Chinese scholars created their own classifications. While antagonism between the two sets of scholars has melted away, neither side has changed its overall position. 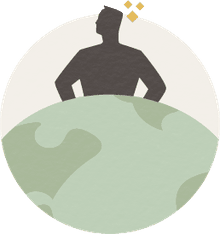 This article is a part of the About.com guide to the Dongson Culture, and the Dictionary of Archaeology. Ballard C, Bradley R, Myhre LN, and Wilson M. 2004. The ship as symbol in the prehistory of Scandinavia and Southeast Asia. World Archaeology 35(3):385-403. .
Chinh HX, and Tien BV. 1980. The Dongson Culture and Cultural Centers in the Metal Age in Vietnam. Asian Perspectives 23(1):55-65. Han X. 1998. The present echoes of the ancient bronze drums: Nationalism and archaeology in modern Vietnam and China. Explorations 2(2):27-46. Han X. 2004. Who Invented the Bronze Drum? Nationalism, Politics, and a Sino-Vietnamese Archaeological Debate of the 1970s and 1980s. Asian Perspectives 43(1):7-33. Loofs-Wissowa HHE. 1991. Dongson Drums: Instruments of shamanism or regalia? Arts Asiatiques 46(1):39-49. Solheim WG. 1988. A Brief History of the Dongson Concept. Asian Perspectives 28(1):23-30. Tessitore J. 1988. View from the East Mountain: An Examination of the Relationship between the Dong Son and Lake Tien Civilizations in the First Millennium B.C. Asian Perspectives 28(1):31-44. Yao A. 2010. Recent Developments in the Archaeology of Southwestern China. Journal of Archaeological Research 18(3):203-239.